Going viral means the content that was posted on a social media site is being liked, commented on by thousands or even millions of people, but most importantly, your content is being shared. It could be shared on multiple sties- Instagram, Facebook, YouTube; the list goes on! Whether or not something goes viral, depends on the content. 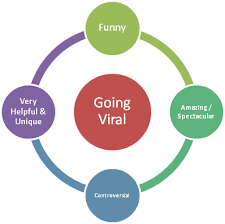 The info graphic above has four points that I think are important, but viral content is more than those four things. It’s also memory triggering and elicits an emotion, But keep in mind, just because your content has any of these characteristics, doesn’t guarantee that it will go viral. I recently logged onto my Facebook page and the first thing I saw was a link to a Facebook video about a kid telling his mom that he doesn’t want another sibling! This little boy couldn’t be older than six or seven years old. Why his mother decided to post this video to YouTube is beyond me, but I appreciate it, because it made me laugh…for a couple minutes. This video was shared more than 163,000 times. Why? Because it was funny and cute! The saying “kids say the darnest things” rang true in this video. Facebook and YouTube videos go viral, but I don’t think anything goes viral faster than a meme. This one is one of my favorites. Its a play on a scene from the popular movie The Hunger Games. 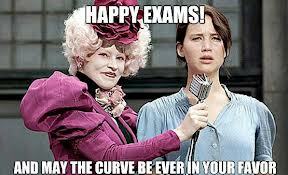 I see it on Twitter and Instagram every year around midterm and exam week in college. It’s hilarious, but at the same time it gives us college student’s hope, it elicits an emotion – we know we’re all in this together. So when its that time of the year, I always retweet this meme and wish my friends and followers the best. What makes you share a meme or a video? Are you obsessed with any at the moment? I’d love to know!